We have new owners and are currently undertaking a review of our designs and services. Stay tuned for some exciting news coming soon! SPACE2.0 is an award-winning, architecturally-customisable, high performance building system. 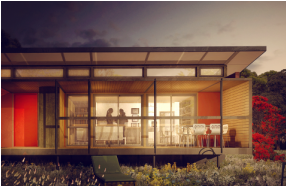 Modern design, environmentally sustainable, healthy materials and highly efficient in its energy demand, SPACE2.0 is unfolded and assembled on-site within days for immediate occupation.